The Adria Hotel is located in one of the best districts of Kyiv, just 8 km away from the city centre and 30 minutes' drive from Boryspil International Airport. The National Exhibition Сentre is situated nearby. The hotel offers 65 cozy rooms of different categories: Single, Double and Junior Suite, including 18 non-smoking rooms. Every room features air-conditioning, a minibar, a telephone, a TV-set, a hair-dryer. The Riviera restaurant's cuisine is distinguished by a rich choice of European and Japanese dishes, a fine wine collection, a large assortment of cocktails and elite tea. 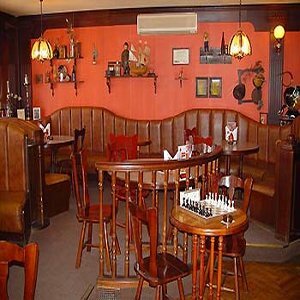 The JOSS pub is decorated in old English style. Guests can play traditional pub games here: darts, skittles, and chess. The JOSS casino was opened in 1993 in the building of the hotel. The hotel offers 5 conference halls with a capacity of up to 300 people and all necessary facilities available. The following hotel services are also at guests' disposal: guarded parking, gift shop, taxi call, newspaper service, laundry service, air and railway tickets booking, Internet access.